If you are a lover of butterfinger candy bar, then these Valentine hearts are a must try. Your favorite crunchy peanut butter candy covered in a smooth milk chocolate in the shape of a heart. Now I know it must just be me, however these hearts seem to taste so much better then a regular candy bar. Is it just because it it heart shaped or maybe it is because you get more of the crunchy candy ? You be the judge. Not only are these fun just to eat, but they also make great treats for your Valentine's day party or classroom hand outs. Let's face it although the candy conversation hearts are the number one selling Valetnine's Day Candy how many of those can you eat ? Chocolate is what everyone loves and what would be better the chomping down on a Butterfinger heart? Junior mints are an old time candy favorite that became very popular in the late 50's and early 60's. A dark chocolate candy with a cool creamy mint filling. They even have a version for Valentine's day, Heart shaped Junior Mints. 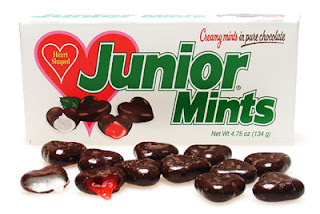 Just like the traditional Junior mints these are a dark chocolate candy with a mint filling. These however are in the shape of hearts and some of the mint filling is red. What a perfect Valentine Gift for anyone who likes Junior Mints. These are a seasonal item and are available for only a short time. Make sure to buy yours early as they sell out very quickly. Nothing can compare to the nervous tension of a classroom on Valentine’s Day. We all had that one special crush in our life, and on this day all of our sophisticated courtships, the teasing, the chasing, the occasional hair-pulling, all these would come to fruition. The Valentine’s Day card itself was unimportant, it was but a blank canvas from which gauging our beloved’s intentions was a futile act. Ostensibly, we could have written our heart’s secrets there, and concluded the matter entirely. But then, we were children, we communicated in mysterious ways. What truly mattered was the message on the Sweethearts candy attached to the card, for on those heart-shaped pastel tablets the final verdict of our endless yearning was inscribed. There was the apologetic rejection of ‘Be Good’, the encouraging, but insubstantial ‘Sweet Talk’, and, of course, there was the wild, electric elation of ‘Kiss Me’: as concrete a sign of love as there ever has been. Eating Sweethearts today brings back all the mixed emotions of those young romantic forays. Although we’ve grown older, and now express our desires more maturely, slipping a loved one a ‘Kiss Me’ Sweetheart is just as effective as ever. Sadly, Necco, the maker of Sweethearts since 1866, recently bowed to the demands of modern candy, and fiddled with the classic formula. The old-fashioned sayings, replaced by bizarre modern updates like ‘tweet me’ and ‘you rock’. Even more is the change in flavor. The taste of Sweethearts used to be in harmony with the fragility of our Valentine’s Day emotions: sugary enough to soothe the most desolate soul, yet not too strong to overpower the fuzzy feelings of love. Now they come in flavors that appeal to our youth like ‘blue raspberry’, and possess a sugar kick more saccharine than soothing. Thankfully, the nostalgia of your Valentine’s Day remains safe, because Necco’s original Sweethearts are still available online at O’Ryans Village. Sold in a 17 oz bag, these original Sweethearts feature the same sayings and flavors you loved as a kid. Grab a bag today, and let your loved one know they are still the classroom crush of your life! Candy Buttons Are Back !